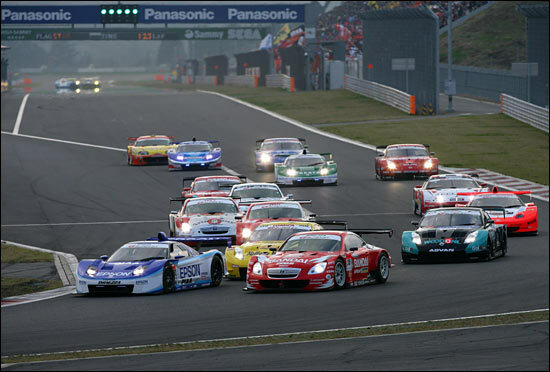 Motors TV concludes its 2006 sportscar coverage with the final round of the Japanese Super GT series from Fuji on Saturday evening, November 11, at 17.30 GMT. Mark Cole and Carlton Kirby will present the full two-hour Fuji 300 Kms (delayed from last Sunday) as eight teams - in the world's fastest GT cars - fight for the GT500 title. Eight different factory cars won the preceding eight races: three to Honda, three to Toyota-Lexus and two to Nissan, so it was wide open ahead of the last round. So too in GT300, where three teams were still chasing the crown, headed by the stunning Mooncraft Shiden of Hiroki Katoh and Kazuho Takahashi.